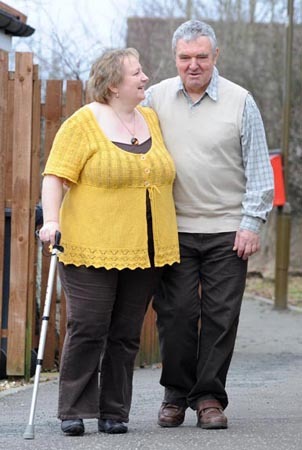 Evelyn Ralston from Blackburn in West Lothian was just 47 when her partner Neil, then 61, was diagnosed with dementia. Here she explains how she is learning to cope with the support of a BIG funded project. “Several years ago, I began to notice a change in my partner Neil. Misplacing important items, getting lost whilst at his workplace and even forgetting where we lived were just some of the small tell tale signs. But still it came as a shock when the doctor told us he had early onset dementia. “Our lives were turned upside down. Instead of focusing on a new career I had to come to terms with being a full time carer. Neil, too, was forced to give up his job as he could no longer do routine jobs and was often getting lost on the way to, from and inside his work. “When you become a full time carer for someone with dementia nobody tells you what to expect. You have so many questions. How will I manage? How quickly will this illness take hold? How will we survive financially? “I realised I couldn’t cope on my own and, at a complete loss, I contacted Carers of West Lothian. A Carer Support Worker came to see me and put me at ease right away. He suggested a course for carers in Whitburn which provides day care for people with dementia. The staff there were fantastic and to this day they continue to give me lots of support. He also arranged that I take some counselling sessions to help me to cope with the depression caused by my sudden change of circumstances. Then there were the forms to fill in and questions about money so he put me in touch with someone to help with those things as well. “As a full time carer I have come to realise that if you just keep quiet and accept things you don’t get anywhere. That’s why I have become so involved in trying to raise awareness about the lack of facilities for people with early onset dementia (when someone suffers from Alzheimer’s disease before the age of 65). You may be offered a day care place but it will be full of people much older and in a far more advanced stage of the illness. 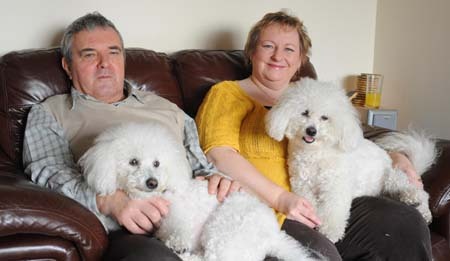 Neil was diagnosed at just 61and he certainly wasn’t ready to sit and pass the time away. He still likes to get out and meet new people. “That’s one of the reasons why Carers of West Lothian has been so good for us. We have met two very good friends whose husbands also have early onset dementia and together the six of us go on holiday and do lots of fundraising activities together. Over the years I have lost touch with many friends so it’s wonderful to have new ones around me who are going through a similar experience. One of the most difficult things I have had to come to terms with is the change in our relationship. Sometimes I can be watching TV and a tremendous feeling of loss will just descend. I’ll look for someone to talk to but the same person I once knew is slowly slipping away. Don’t get me wrong, Neil and I still like to do lots of things together. Despite everything Neil has a great sense of humour. In the early days there was one time when Neil took our dogs, Penny and Poppy, for a walk and he returned with two leads on just one dog. Its times like that when we could get frustrated but instead we choose to laugh about it.